Sanrio Puroland turns its main buffet restaurant into a new space for visitors to meet some of the most popular Hello Kitty Land characters. The restaurant changes its interior design to a calmer decor inviting visitors to relax. 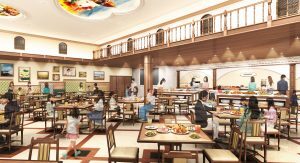 Tokyo, Tuesday 19th March, 2019 —- On 19th, April 2019, after a three-month refurbishment closure, Sanrio Puroland’s Yakata restaurant reopens its doors with a totally renewed concept. Leaving behind the original pop-cute pink and white design, unchanged since its first opening in 1990, the restaurant’s interior design and decorations changes to a relaxing brown and white colour scheme truly inviting Hello Kitty Land Tokyo visitors to chill. 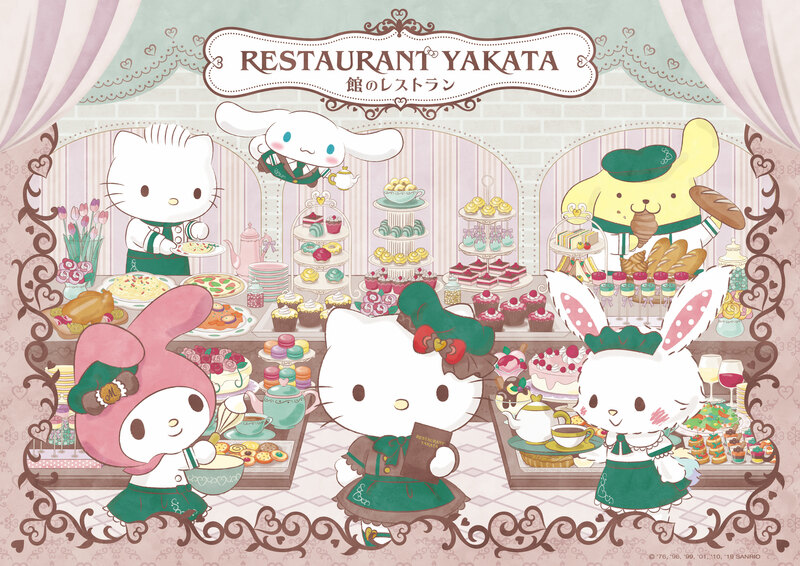 As total novelty visitors to Sanrio Puroland (URL : https://en.puroland.jp/), also known as Hello Kitty Land Tokyo, can now meet some of their favourite characters in the Yakata restaurant. 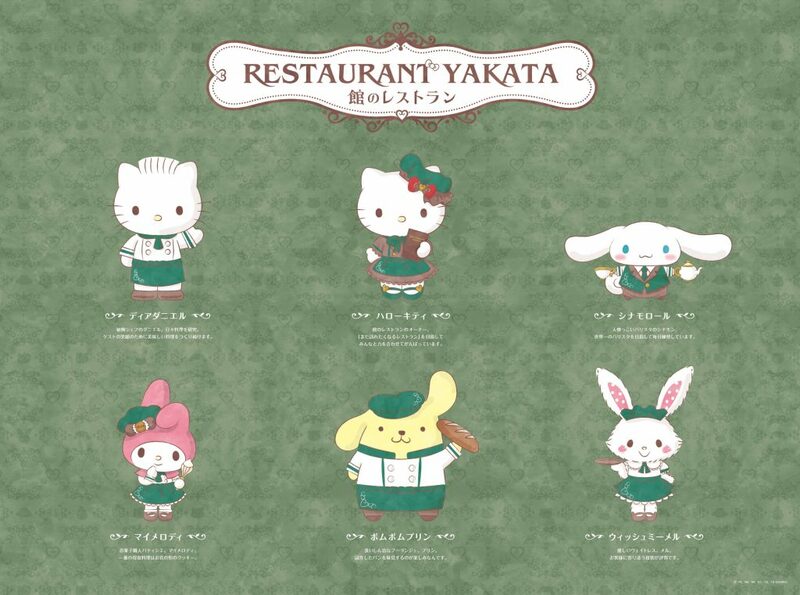 Dressed in the restaurant’s original waitress outfits Hello Kitty, Dear Daniel, My Melody, Wish me Mell, Cinnamoroll and Pom-pom purin will appear randomly to meet and greet restaurant visitors at each and every table. The restaurant’s buffet with over 40 different menu options, offering ample choices for varied dietary requirements including also vegetarian and food intolerances, also features some new tasty food items. 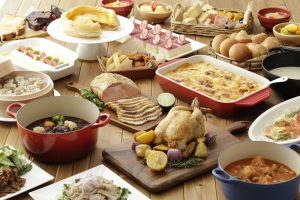 The menu choices range dishes such as special roast chicken, homemade beef stew, roast pork, salads, desserts and much more. Hello Kitty Land Tokyo visitors can now opt for an all-you-can-eat-and-drink menu at the set price of 2,800 JPY (1,400 JPY for children from 6 to 12 years old and free for children below that age). Visitors a welcome to eat and relax at the restaurant during a 70min time slot set to ensure that all visitors can enjoy this new Puroland meeting space. The Hello Kitty Land Tokyo in-door theme park can also be rented for private or corporate events on any days it is usually closed for the public. ©1976, 1996, 1999, 2001, 2010, 2019 SANRIO CO., LTD.
Sanrio Puroland, operated by Sanrio Entertainment Co. Ltd, is also known as ‘Hello Kitty Land’, a theme park to meet and experience its much-loved Sanrio characters including Hello Kitty which enjoys worldwide popularity. Considered the “Mecca of Sanrio characters”, the park draws great numbers of fans from around the world. Located in the outer districts of Tokyo, Sanrio Puroland is an indoor theme park, visitors can enjoy regardless of the weather. Sanrio Entertainment Co. Ltd also runs an outdoor theme park, Harmonyland, located in Oita Prefecture in Kyushu. More information about Sanrio Puroland is available at http://en.puroland.jp/. Sanrio Entertainment Co. Ltd. Overseas PR Agency Contact: Maaya Kinoshita, Ayako Noda, Bluemoon Marketing Inc.